BMW’s new 2010 X3 is entering the final phases of sign-off ahead of launch in late 2010. 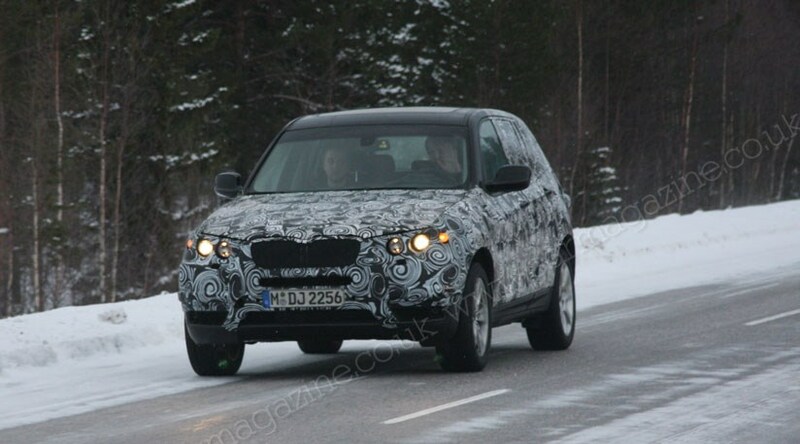 Our spies have scooped this production-ready BMW X3 prototype testing on the icy roads of Sweden. BMW X1, BMW X3, BMW X5… talk about confusing! Munich has certainly thrown itself into the SUV market with aplomb. Our latest spy photos suggest that the new X3 looks closely related to the X1, but the tape measure says otherwise. Where the X1 is like a 3-series on stilts, the X3 will grow up this time. It’s bigger and – once you remove the drug-addled snowstorm disguise – the new 2010 X3 has chunky, solid SUV proportions that’ll look quite different from the X5. Although it’s roomier inside than today’s X3, it has just two rows of seats to differentiate it from its seven-seater big bro. A range of four- and six-cylinder engines will be available on the new X3, spanning from a 2.0-litre four-pot to a 3.0-litre straight six twin-turbo model. Expect the usual array of stop-start tech, Efficient Dynamics and an mpg-enhancing eight-speed auto transmission. You’re right. Build quality has long been an issue and many feel today’s X3 never had enough differentiating factors to distance it from the well received, bigger X5. But it hasn’t been a total sales disaster. BMW has flogged 550,000 of them since launch, and they hope to improve on that with this clearer proposition second time round. The new 2010 X3 will be built in the US at the same factory that builds the X5. The current X3 is built by Magna Steyr in Graz, Austria – the switch puts it closer to its biggest market and should, Munich hopes, improve the quality.